To start off the New Year, here are progress updates on our ongoing botanical art projects. Jurying for the 2015-16 submittals for the digital Florilegium has been completed, and of the 96 works that were submitted, 76 were accepted into the Florilegium. The jurors were Gene Josephs, Chris Bondante, and Margaret Pope. There are 14 artists represented in the Florilegium from Tucson, Phoenix, and Denver areas. Anyone unfamiliar with the digital Florilegium or florilegia in general can read about the project in the October 2014 Desert Breeze or on our website. All 76 works in the Florilegium can be viewed sequentially in a gallery section, or single works can be selected for viewing from a Browse page. Each work has a dedicated page with a zoom function for viewing the intricate details of the plants portrayed in the art. For the scientific botanical illustrations in the collection, annotations are provided next to the artwork to describe the plant structures represented in the drawings. Additionally, brief biographies are presented for the 14 artists. Sixty-nine species of native Sonoran Desert plants are represented in the Florilegium, and an alphabetical species list is included on the site. We are currently working to provide a species profile for each plant. If you want to see these fascinating and informative works of art, the Florilegium Program’s website home page has a quick link to the Florilegium’s Browse option. Included in the 76 works accepted into the Florilegium are 21 botanical illustrations by 9 artists that were prepared for the Desert Legume Program’s upcoming publication, Legumes of Arizona: An Illustrated Flora and Reference . The book, which is expected to be published in 2017, will include nearly 120 botanical illustrations by 30 artists from Tucson, Phoenix, and Denver. A number of previously published works will also be included. 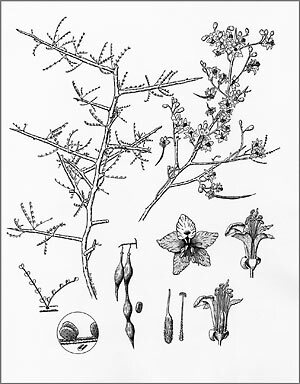 The drawings have been prepared from live plants, herbarium specimens, and photographs. The first botanical illustration for this florilegium was accepted in 2016 and is now being held in Special Collections at the University of Arizona Library. 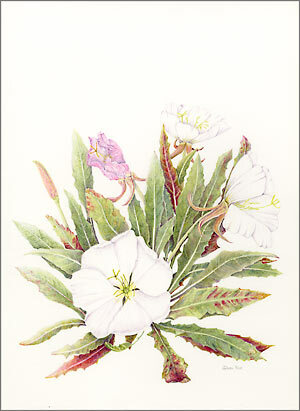 The painting of Opuntia basilaris is by Chris Bondante and can be seen in the September 2013 Desert Breeze and in the Sonoran Desert Florilegium (all of the works accepted into the Krutch Garden Florilegium will be automatically accepted into the Sonoran Desert Florilegium). Many of the artists who have been contributing works to the Legumes of Arizona project have also committed to completing illustrations for the Krutch Garden Florilegium. The Sonoran Desert Florilegium Program is currently working with the Campus Arboretum to raise funds to purchase these illustrations. More information about this project can be found in the May 2015 Desert Breeze . This appeared in the January 2017 issue of the Desert Breeze, the monthly newsletter of the Tucson Cactus and Succulent Society.